Is it just me or is January the most miserable time of year (I am writing this on a day with 30mph winds and steady sheets of rain). It always seems to take me ages to recover from Christmas (a wonderful time spent in London visiting with family and friends old and new, including my friend Peter’s beautiful new baby girl). Anyway there always seems to be a lag in time recovering from being back in the old country and feeling settled back into life here in the states. That’s my excuse for doing nothing with the blog for a while anyway. It also doesn’t help that January is not my favorite time of year for birding. Although I compile the Big January for Connecticut I have to say that having done one once I pretty much vowed never to do it again. I just can’t handle the endless ‘on the go’ pace of the whole thing – more power to those like Tina, Meredith and Sara who throw themselves into the spirit of the thing with gusto – I don’t know how they find the energy! Anyway this weekend I was back out on the birding trail running a daytime owl prowl. Now as it is owls are hard enough to find even at the best of times but to get to see them during the day it really takes some serious scouting. I basically spent the majority of the week pulling in favors, begging people like AJ who is something of an owl expert and aficionado for tips and traipsing through pine woodlands looking for traces of owl activity. For the most part I was finding a lot of owl sign and not a lot of owls. You also have the misery of owls that you have staked out suddenly deciding to move on just before the day of the walk. Pretty stressful all in all! It’s all worth it though when you manage to get to the end of a walk with 5 pretty decent owl sightings under your belt. The day started fairly auspiciously when at the first stop a mob of Blue Jays were squawking intimidatingly around the group of pines I was hoping to see our first Barred Owl in. Sure enough these mobbing birds were onto our quarry much quicker than we were and as we watched their frantic behavior a, thus far, hidden Barred Owl dropped out of the trees and flew off for what it hoped would be a quieter pine to roost. Whilst all the time harassed by the baying corvid mob! As I explained to the group, mobbing birds can be your friends and on a number of occasions they have led me towards an owl camouflaged from a mere human’s eye. With a couple more excellent flyby views under our belts as the bird flew this way and that to lose his pursuers (the jays – not us) we left the owl to deal with his tormentors. A few more stops yielded some successes and some failures: another Barred Owl perched in some coastal tangles ( but not the Long-eareds that had been hoped for) that provided us with the chance to study the contents of one of the owls pellets and to see the tell-tale whitewash signature that denotes a regular roost. 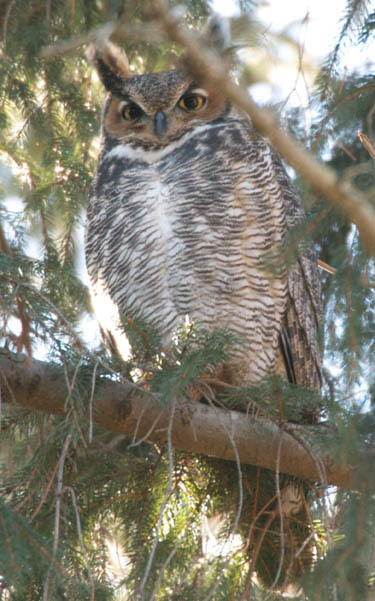 A couple of Great Horned Owls were already getting set up for the serious business of starting a new family for the year, and we had beautiful views of the North-Easts most diminutive owl: the Northern Saw-whet, a bird that one only really encounters in the state in migration and winter. All in all a pretty successful trip and one that though tough to organize, was all the more rewarding in its success. This year has been a fairly tough one for owls it seems, with very few reports of diurnal owls such as Short-eared and Snowy. Although not reportable in CT, the word on the grapevine is that Long-eared sightings are fewer and farther between than recent years as well. Perhaps the abundance of natural food this year has lead to a corresponding boom in their prey numbers to our north and they just don’t feel the same need to roam south. 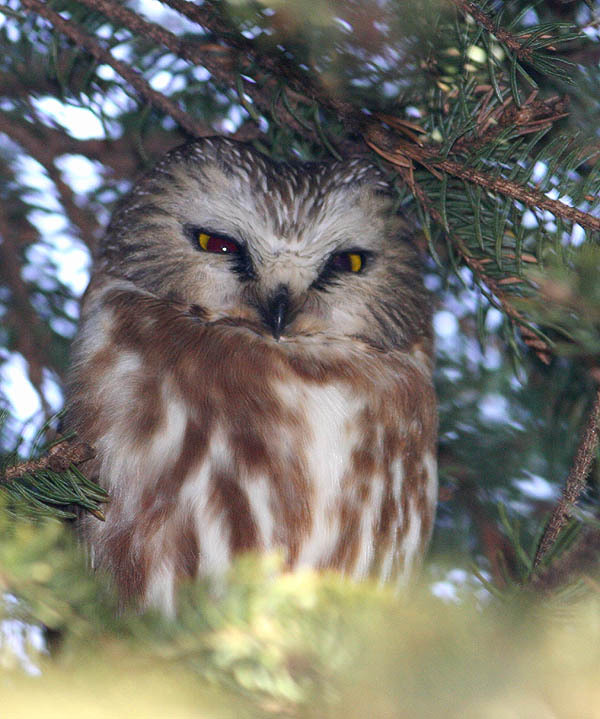 A good thing for the owls but not so good for your prospective owl hunter! Thanks to Matt Thomas for the kind loan of a couple of his shots from the trip – thanks for sharing. 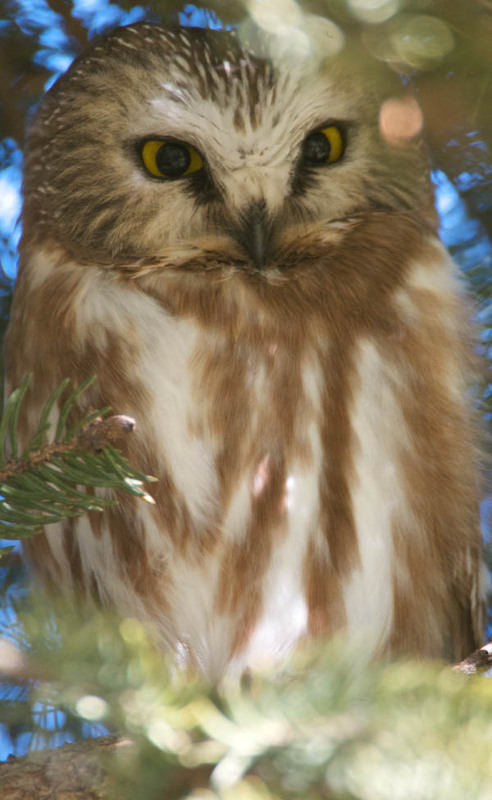 Trip Sightings: Barred Owl (2), Great Horned Owl (2), Northern Saw-whet Owl (1). Others: Canada Goose, Mallard, Ring-necked Duck, Red-tailed Hawk, Red-shouldered Hawk, Herring Gull, Ring-billed Gull, Rock Pigeon, Mourning Dove, Belted Kingfisher, Downy Woodpecker, Blue Jay, American Crow, Black-capped Chickadee, Tufted Titmouse, Red-breasted Nuthatch, Golden-crowned Kinglet, American Robin, European Starling, Eastern Towhee, American Tree Sparrow, Song Sparrow, White-throated Sparrow, Dark-eyed Junco, Northern Cardinal, American Goldfinch, House Sparrow. good to see you’re back on the trail! Wow! “…. harassed by the baying corvid mob” – would do Shakespeare proud. Glad to see u back…but Burrrr…it pretty cold …looks like a great Owly day u had..